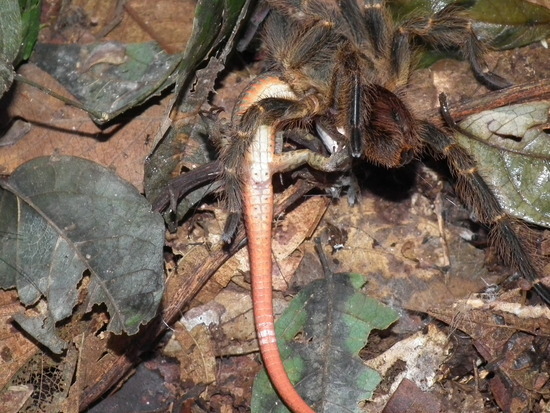 Scientists have published the first known account of a wild tarantula killing and eating a snake, and every part of it is actual nightmare fuel. While spiders have been known to kill snakes in the past, this particular species of tarantula doesn’t produce venom, which means it would have subdued the snake by mashing at its flesh with its fangs to expose its insides, before liquifying everything for easy digestion. The grisly encounter was discovered by grad student Leandro Malta Borges, from the Federal University of Santa Maria in Brazil. 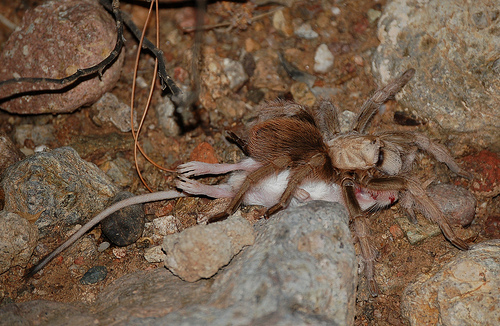 Borges and his colleagues were out in the Serra do Caverá region of southern Brazil looking for tarantulas as part of a research project, when they stumbled on a large Grammostola quirogai tarantula huddled under a rock, grasping a snake just below its head. The Almaden ground snake (Erythrolamprus almadensis) stretched to almost 40 cm (15 inches), making it surprisingly large prey for the tarantula to wrangle. But that wasn’t the strangest thing about this bloody mess. As Borges told Stephanie Pappas at Live Science, there’s no scientific evidence to suggest that G. quirogai tarantulas wield venom strong enough to sedate the snake. That means it mainly had its muscular fangs - which grow to an impressive 2 cm long (0.8 inches) - to bite the snake into submission. "Predation of such a large snake in relation to the size of the spider was extremely surprising to us," Borges told Live Science. 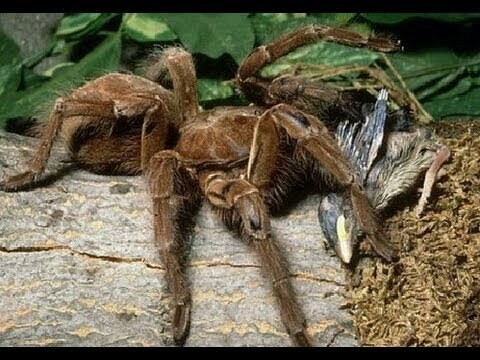 Due to their relatively large size, tarantulas can get away with eating prey that many other types of spiders can't, such as birds, frogs, lizards, and mice. Unfortunately for this particular prey, Almaden ground snakes aren't venomous, so the whole encounter would have been a battle of brawn, with the spider ultimately winning out. Usually, if a spider has conquered a snake, it's because they've used a web, venom, or both. "There are other records of spiders preying on snakes, such as the famous black widow, which has a strong toxin and, besides, rely on the web for capturing," says Borges. The report notes that there are previous accounts of tarantulas killing and eating snakes, but all have happened in captivity or in experiments. This unprecedented wild encounter probably represents the snake being in the wrong place at the wrong time, and the tarantula knowing a good meal when it sees it. "Most likely, the snake was surprised upon entering the spider’s environment and hence subdued by it," the report concludes. With huntsman spiders eating a lizard on a family's living room window and dragging a mouse corpse up a refrigerator door recently, spiders are either diversifying their diets, or we're just starting to realise how powerful they really are. Either way, respect. Just please stay away from our bedrooms. The account has been published in Herpetology Notes.